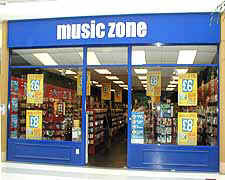 With Music Zone going into administration last week by the end of January my hometown could be left without a record store for the first time in the 28 years i've lived here in Altrincham. This was a town that once was host to 3 record stores for its 45,000 residents each catering for a different market. Our Price for the smash and grab popular chart hits; Omega Records which was owned by the Charlatans manager Steve Harrison and catered for the indie kids as well as having a specialist dance section for vinyl which was run by Jason Orange's brother; and finally Sputnik Records which specialized in heavy metal and rare bootlegs and live CDs. Even WH Smith had a fairly broad spectrum which matched most small record shops for choice nowadays. For those that have grown up with downloads being the norm you may not flinch at the idea that the only place the residents of this small town will be able to buy CDs from are Tesco's and Sainsburys, which is fine if you're interested in the latest album from James Blunt or this years X Factor winner. But what about those people who still keep an active interest in new music through outlets like Jools Holland or hear new music by chance because XFM is the radio station of choice at work and simply don't know the difference between an IPOD and Myspace (seriously you only need to do a search of your friends network on Myspace to check the number of people aged over 30 in your extended network of friends and you'll realize that not everybody sources out new music on the web). Take an artist like Manchester's Cherry Ghost who recently was plucked from relative obscurity for an appearance on Jools Holland or even more broadly entertainment wise Donny Tourette's appearance on Celebrity Big Brother. In the past your older brother or parents may have been able to simply pop into the local record store and listen to the tracks on a listening booth or at least have the facility to order these items rather than waiting 2 months for the next major shopping trip to the nearest out of town shopping centre, by which time these artists will be long forgotten and they'll plump for the latest Beatles re-issue to satisfy their musical nourishment. The recent changes in the chart rules suggested that the introduction of downloads into the chart as a single entity that needn't be tied to a physical release would make for a major upheaval to the charts as we know. The first week proved with the re-entries into the charts from Snow Patrol, Gnarls Barkley and The Automatic that the expected flurry of classic back catalogue songs for the time being is a fallacy. The physical format for releases is still what makes up the majority of singles and albums in the charts and for the younger generation who have grown up with downloads the death of the local music shop will mean nothing, for people of a certain age it's their last major lifeline to music gone. There are hundreds of town like Altrincham, South Manchester that are suffering the same fate and losing their local record stores. Just for one minute sit back and think what it must be like to only have the Top 40 Albums to select from because it's not profitable for Tesco's to supply more choice.